TEE, "Trans-Europ-Express", formed European International train network, and meet business trip requirement with all-first-class accommodation. All TEE trains stopped operation due to the competition with the network of Airline and high speed train, however, TEE still remains the symbol of the golden age of European railway, I think. 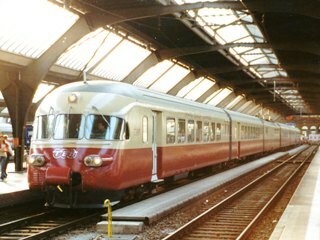 SBB/CFF RAell type EMU was used for TEE Cisalpin and Gottardo, and one trainset is preserved in active condition. For the purpose of international through operation, this train equips 4 pantagraph to take 4 different types of electric supply, and motor car is placed in the middle. Filmed at Zurich Hbf on 1 Aug, 2003. (upper left)Interior of 2nd class (upper right)Interior of 1st class. (lower left)Interior of cafe (lower right) Coupled with French loco. Photo at Montpellier in Mar, 2007.